A leading equipment and service supplier to the NHS has improved the electrical testing of thousands of medical devices located at sites around the UK using Rigel Medical’s 62353 safety analyser. Castle Donington-based Medstrom supplies and maintains electrically operated paediatric cots, bed movers, reactive therapy systems, patient beds, trolleys and carts among other items to hundreds of hospitals and healthcare facilities across the UK. These have to be regularly tested to ensure compliance with IEC 62353, the standard for in-service and after repair testing of medical electronic devices. The testing work is undertaken by Medstrom’s field service engineers who have been equipped with Rigel 62353 analysers, enabling them to check the electrical safety of equipment to ensure it is safe for use by both patients and staff. The ability to be able to do this quickly and efficiently means that critical safety tests are completed successfully as an integral part of Medstrom’s after sales support, and dedicated service team ,saving time and boosting customer service levels. Twenty four units have been supplied to date, combining the benefits of an automatic and manual tester with advanced data logging to provide improved asset management capability. These include a long life battery which provides enough power to enable each analyser to complete more than 60 tests per day without the need for constant re-charging. 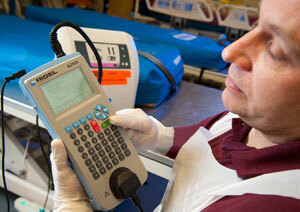 “The Rigel 62353 is a superb high performance instrument that works extremely well and delivers consistent results. “It’s very intuitive, offering a single-button test solution which engineers, who have busy service schedules to complete, really appreciate. Darren Hunt added that having the future proof analysers is beneficial as there are plans to start using them for testing the safety of type B and BF applied parts fitted to life support equipment currently in use at contracted accounts. The Rigel 62353 was the first analyser of its type offering automatic sequencing, onboard data storage and data entry in a lightweight, easy-to-carry enclosure. Improved battery power provides extended operating life while the instrument’s lightweight feature makes it extremely practical and easy-to-transport from site-to-site. Other features include an easy-to-use facility for testing up to two individual Applied Parts from different modules or classes – for example, BF and CF class and either fully automatic, semi automatic or manual testing. A full graphic LCD display has been incorporated with an integral alpha-numeric ABCD keyboard for quick and accurate operation.